Eric Hsu from Beyond the Dyno at MotoIQ wrote up a great article detailing the Cosworth pistons and rods for the Nissan GT-R VR38DETT. At stock power levels 480 hp each piston and rod combination needs to be able to support 1/6th of the force placed on them. This figure is often broken down by horsepower, but horsepower alone is not a very good judge for the "strength" of a piston or rod. 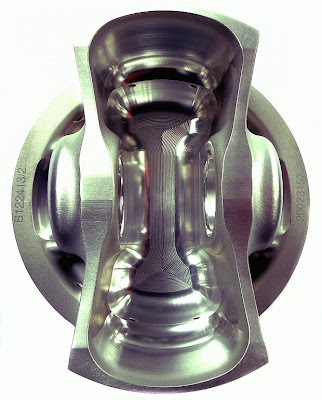 The weight of a piston, and its speed play huge parts into the durability of the component. Stock parts are good for stock power. With the GT-R, its easy to make over 500 horsepower at the wheels on the stock turbos. Once you upgrade to larger turbos, its possible to get 600, 700, 800 horsepower out of the stock engine. The problem with pushing the stock components this hard, is they are way outside of their design parameters. Eventually the rods bend or the pistons fail, and there is a catastrophic engine failure. 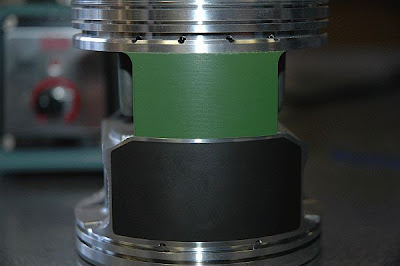 The piston is usually the most fragile internal component of the bottom end and yet it takes the bulk of the forces created by combustion events. It is has to deal with thermal shock by being constantly massively heated and instantly cooled, accelerated and forced up and down by massive forces, has to transfer these forces to the wristpin and connecting rod all 720° of crank rotation, and all the while it has to be able to live in harmony with smaller components that are inserted into it that are made of unlike steel alloy materials such as wristpins, piston rings, and clips. The Cosworth VR38 connecting rods have also just been released. These rods were designed for 200 hp EACH. The rods are made from EN40B (similar to SAE4340). 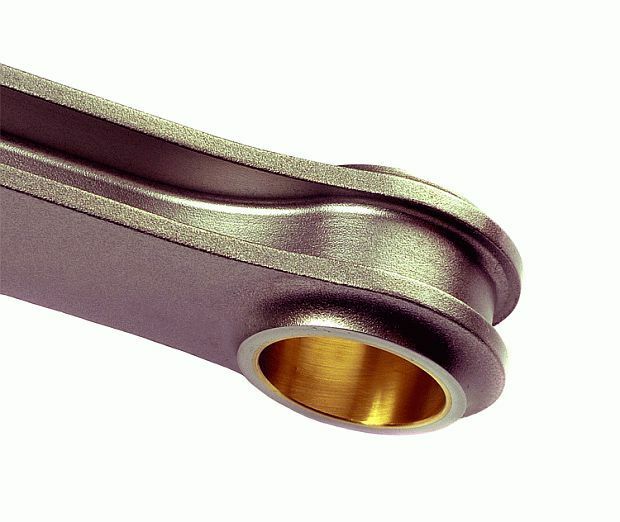 The pin end bushes are a high quality bronze material superior to most stock shelf rods and all Chinese rods. Cosworth rod bolts are made of H11 tool steel. Also notice the lightening pockets on the big end to the sides of the big end bore. This is another detail added to further reduce rotational mass without sacrificing strength. As a set the Cosworth rod and piston combination is 2.19 lbs lighter than the factory rods. The rods are 1.34 lbs lighter, and the pistons are 0.847 lbs lighter. A 1 lb reduction in weight spinning at engine speed is like pulling 15 lbs of static weight off a car according to Herb Adams and Chassis Engineering. Get your Cosworth pistons and rods at STILLEN.